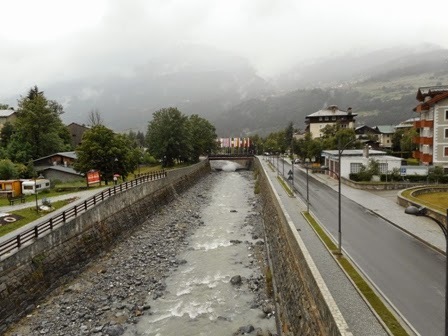 Thankfully it was a scheduled Rest Day in Bormio. I wouldn’t have been riding anywhere in any case. The view of the pouring rain and hail outside our hotel window was like watching the closing scenes of the Lars von Trier film, Melancholia; bloody depressing. I love watching films with unusual and unpredictable scenarios. As bleak and depressing as I found the film August: Osage County it at least had its moments of humour and hope, albeit a brief glimpse at the film’s end. But by the close of Von Trier’s 136 miserable minutes there was nothing; just the thought of a visit to the chemist for some anti-depressants. ﻿Surrounded on every side by mountains, there was not one piece of granite to be seen; only a low grey blanket of drizzle and mist. 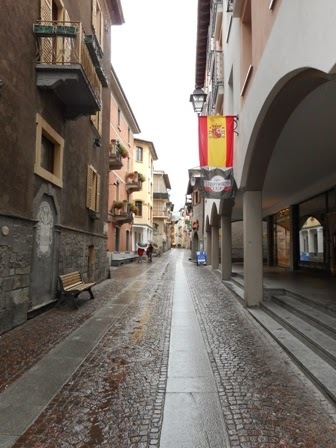 The normally vibrant and busy streets and lanes of Bormio’s Old Town were deserted. Virtually fastened to our seats in our hotel room, Roz and I could at least while away the time listening to the football back home in Melbourne. 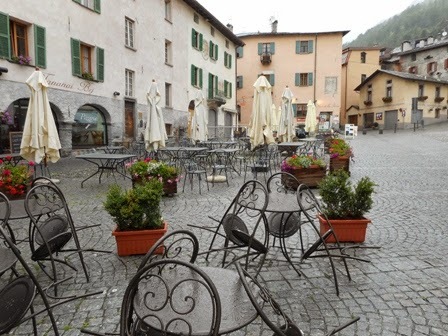 Early afternoon and both suffering from an acute bout of Restless Legs Syndrome, we decided to go for a walk through the town’s still rain-infested streets. In some respects, it was nice to have the near-deserted cobblestone lanes to ourselves, though it was a tacit reminder that the majority of others, both locals and tourists, had decidedly better things to do. Passing one of the cycling stores, inundated with paraphernalia advertising the big three passes in the region, not to mention Italy - Stelvio, Gavia and Mortorolo – you’d be forgiven for wondering what the attraction is; or for that matter if they really existed. It was just that sort of day, all day; and given their height and degree of difficulty maybe it would have been better if that was the case.